It was another unforgetable day, but one I NEVER expected to end the way it did. The story may suprise you. I know I was amazed when it was all over. I am sure in the coming years when I read this entry, it may still suprise me. My Vintage Painting team was ousted in the first round by a 2-1 score in OT. The Ionia Skateland team that beat us went on to lose in the finals, but they really play hard and deserved to win our game. I had no regrets at the end of that game. My undefeated Bulldogs team played next and we lost to the Komets who went on to be the champions by a 5-4 final score. I really can’t say I played badly in either game. I just feel I didn’t play up to par. A goalie only goes as far as his team though. I know I can’t do it alone, and the other teams I faced today just wanted it more than we did. Upon playing my last game, I stuck around the rink just shooting photos and was considering taking off for the day. That is when the Reforms in Copper came calling. The Reforms consist of players I haven’t played for before, but they know me well. Apparently, their goalie chose not to play today and were pretty much told to find someone else. They asked me and I accepted. I really didn’t think much of it to be honest. The Reforms were a good team, but in order to make our mark in these two playoff games, they needed to play intense hockey. Our first game we played against the Pole Hittas. (Side note story, this team got its name due to the face one of their team ran into a pole with his car apparently.) This team had one dominant player and stopping him was REALLY rough. He hit me up for 2 goals early and the team was up 3-0 at one point. My Reforms team came back to score 4 unanswered, while I came up with some timely stops. The save I made that impressed everyone including myself was a diving across the crease to save a puck from going in. I just tipped it away with my stick. However, that dominant player once again came up with a key goal to tie the game. The Reforms notched the game winner in OT to bring us into the finals. My finals game with the Reforms was not going to be easy. Standing in front of us was a Maly’s team who lost only one game all season. As some of you visitors to my blog know, the Stick Heads cut me due to the fact I lost to Maly’s. I knew I would need to play the game of my life to win that game. For some reason, I put on my Stick Heads jersey. I have no idea why I did at the time. 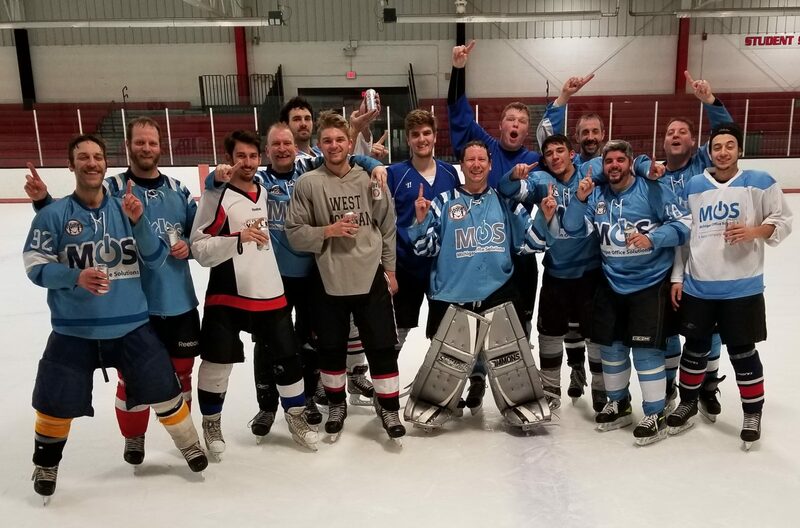 Maybe it was to signify that I played in Copper or the fact that if we did win the game, I could have my picture taken with the trophy with my ex-team’s jersey on. Maybe it would be kind fitting when the Stick Heads looked at the photo and they would notice the jersey. I know, that is kinda childish….but at the time, I seriously didn’t know why I reached for that jersey. Anyway, Malys came out firing right out of the gate, but the Reforms notched the first two goals. Then, Malys tied it up on a pass to the opposite side and tap in, and then off a rebound chance. The Reforms got back up in the game by a 3-2 score with under 5 minutes to play. I skated to the bench to tell my team how good they were doing and if we played the last 5 minutes of this game hungry, we would skate out of here champions. The performed, I got some timely saves, and we notched an empty netter to clinch the victory and championship. It is my 8th trophy, and I am proud to get one. My team, the other team, and my friends were all giving me props. I was just happy to have actually done something positive. After my Bulldogs and Vintage Painting team lost, I thought that I was done until next session. Looks like that is what I get for thinking. Now that I have all these things down, I need to sleep. I was up at 7:00am this morning and it is now 1:22. My eyes are heavy, my contacts are bothering me, and I am so tired. My body aches a little and I can’t wait to slip into bed tonight after a hot shower.